From Thursday 15th March to Sunday 18th at Olympia, we’ll be there, come and see us, bring us your questions and comments, bring us your dogs and cats, we’ll have a good selection with us, plus books, which we’ll be delighted to sign, and for the first 50 customers, a free knitting bag too. 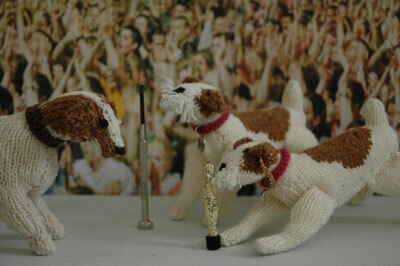 and here in case you didn’t catch it, is a still from our film Uggie gets an Oscar, here he is being presented with it, by a knitted canine version of Brangelina. Uggie and his Oscar will be coming with us to Stitch and Craft.